Vintage Aviator Sunglasses are an absolute must-have for the trendy set. But when you throw in clear lenses and clear frames, your cool factor goes up to 10! 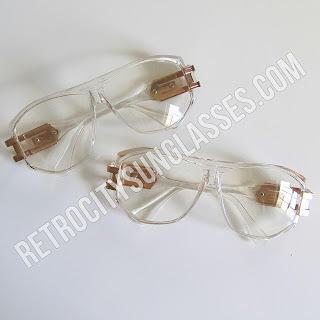 Vintage Aviator Sunglasses with clear lenses and frames and a fusion of urban and hipster styles. They're a nod to the mod fashion of the 60's (hipster) but the sleek lines are also a characteristic of urban style shades. These particular Vintage Aviator Sunglasses are doubly cool because of the awesome bronze metal accents. It's takes a truly stylish person to be able to pull off this look. But don't try too hard, because a pair of Vintage Aviator Sunglasses, black fitted hoodie, and designer jeans, and a par of Jordans are all you need to make this look work!